Shift into N (Neutral) if equipped with an Dual clutch transmission. 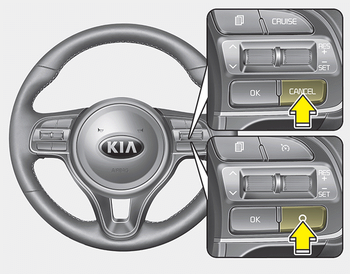 Press the CANCEL/O button located on the steering wheel. Decrease the vehicle speed lower than the memory speed by approximately 20 km/h (12 mph). Decrease the vehicle speed to less than approximately 25 km/h (15 mph).